Consider this scenario: You have a sales quotation with nearly 100 line items prepared for a customer/prospect. Another customer/prospect inquires about same set of items. Are you going to enter that 100 line items again on the new quotation? If your answer is YES, then you are seriously wasting time. This is not a new feature and is existing for long time now. So I am not going to explain anything new obviously. I just thought, for those who have not used this feature or not knowing about it till now, it’s a great one to be availed. Just make sure that you read all options out there and select only relevant options for you. For instance, you may not want to *Copy Markdowns* from source document to target document. You may have given a discount to previous customer which you may not want to expose it to new customer. 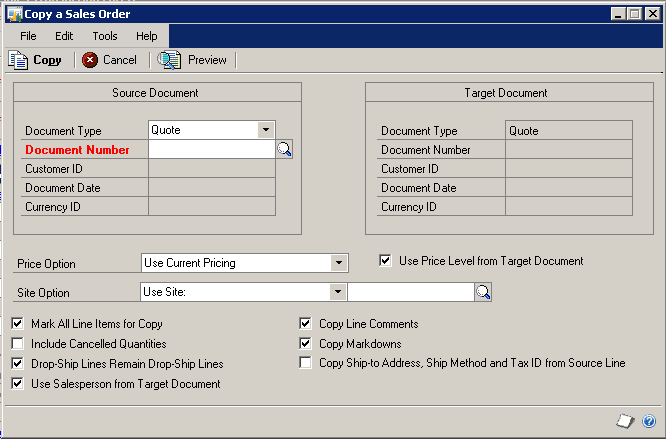 Trust me, this feature saves immense data entry time and eases out sales document preparation. This entry was posted in GP Functionality, Sales Document Copy, Sales Order Processing, SOP and tagged GP Functionality. Bookmark the permalink.